Tile cleaning is tough work. Grout cleaning is even harder, especially, if you’re using a toothbrush and elbow grease, but a quick phone call or email to schedule tile and grout deep cleaning services with Natural Stone Care can change all that. Our trained technicians use specialized equipment to extract deeply embedded dirt and grime, thoroughly cleaning and sanitizing your tile, grout, and baseboards. We use nonabrasive yet effective methods with adjustable heat and pressure for deep-down clean. We service tile and grout floors, shower walls, tub surrounds, hot tub surrounds, pool decks, table tops, and more in both residential and commercial properties. If your grout has permanent stains or a blotchy appearance due to improper installation, grout color sealing may be the solution you are looking for. 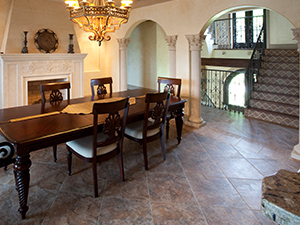 With our grout color sealing (also known as grout dyeing) services, we can match your existing color, or we can change the color of your grout to any color you want and give your floors a completely different look. Plus, color sealing actually prevents staining, a very common grout problem. With constant-acting mildewcides and fungicides, your grout stays cleaner and healthier than unsealed or clear sealed grout. For a free estimate on tile and grout cleaning and sealing throughout Southern California and the San Francisco Bay area, contact us online or call (866) 985-0211 today.